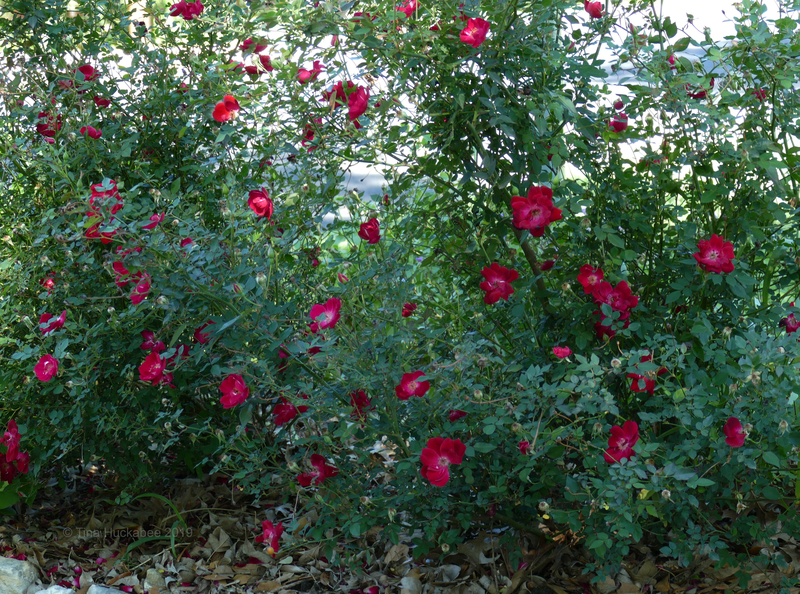 This entry was posted in Cedar Sage, Coral Honeysuckle, Martha Gonzales Rose, Nolina texana, Poppy, Salvia roemeriana, Texas Beargrass, Uncategorized and tagged Garden Bloggers' Bloom Day by Tina. Bookmark the permalink. I do like the hot colors. I am having a great spring in these parts and all my blooms are full of pollinators. I don’t have your expertise to identify them, but there is a good variety. I know you’re having a great spring, I’ve seen your posts! 🙂 It has been a nice one, hasn’t it? It really has been, especially after floods and freezes. Beautiful red is just what I need to see after a grey, cloudy winter/spring! Red will pop you right out of the weather blues! Happy blooms to you, as well. These are are so perdy! I’m so glad to see my identification of bear grass confirmed! I found it on the Willow City loop, growing just as wild as can be, and it took me a good bit of time to come up with a hypothesis. 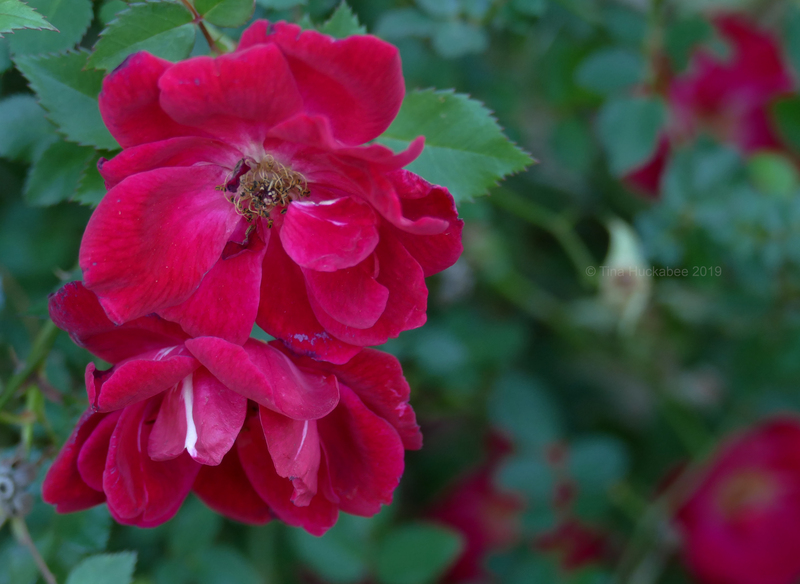 When it comes to red, though, I found something at the Rockport cemetery that really has me stymied. I haven’t been able to find anything like it in my books or online. It was a smallish tree or large shrub — and beautiful. Have you ever seen this? Wow–I don’t know what it is, but it’s a looker! It almost looks begonia-like. It has that fleshy look and the vibrant color. Funny, it’s kind of ringing a plant bell for me. I grew up in Corpus Christi and like most coastal places, there’s a wide variety of plant life, lots non-native, of course. I wonder if it’s something from my childhood. Thanks for sending it. Bear grass! It’s easier to say (and spell) than Texas sacahuista). 🙂 I don’t know why, but I never thought it would bloom in the pot. It’s almost done, so I’m a little sad about that. 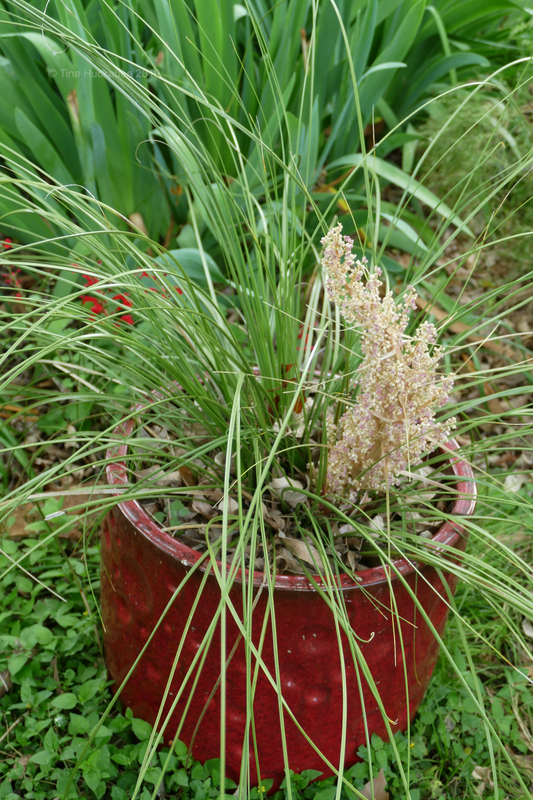 I also have a Nolina lindheimeriana, Devil’s shoestring– https://www.wildflower.org/plants/result.php?id_plant=noli — in my back garden. It bloomed once, and only once. It’s in too much shade, but I think I’d loose it if I transplanted, so it remains where I orginally placed it. The next time I’m down there, I’ll get a photo of the complete plant. I’m still bad about not doing that. As I remember it, there were three of them, about 4′-5′ tall, with a somewhat woody trunk. I’ll check it out more. But it is red! 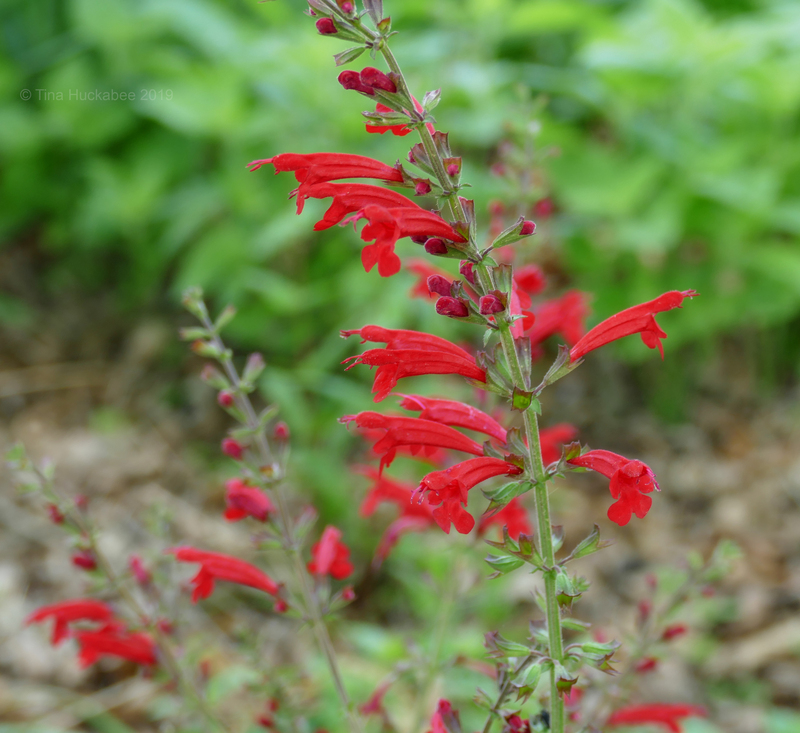 Your sage reminds me of pineapple sage flowers – we grow it where I live in upstate New York as an annual. I don’t see many poppies here and enjoyed yours. 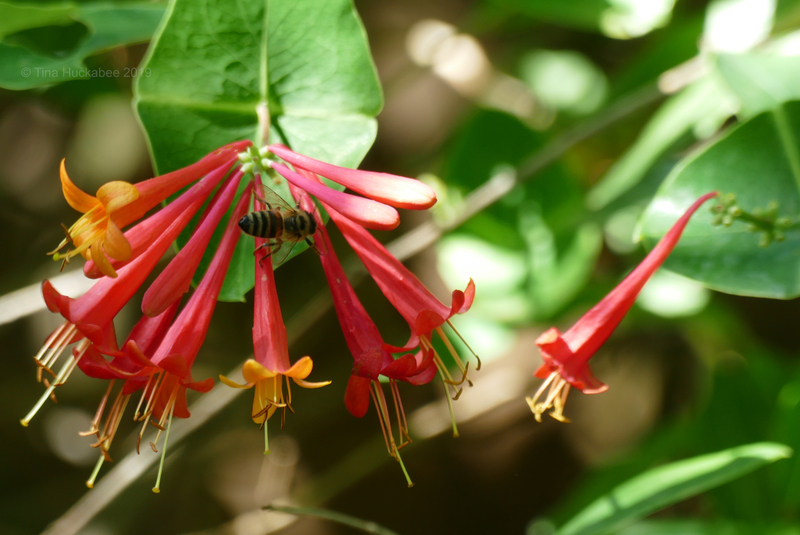 Our honeysuckle will be around in a few more weeks. Happy GBBD to you! Yes, you’re right! They do look similar. I grew a pineapple sage long ago and loved it, though it wasn’t particularly happy where I planted it. Though lovely, it’s not quite as hardy here as the tropical sages–I require hardy in my garden! 🙂 Happy blooms to you, as well. 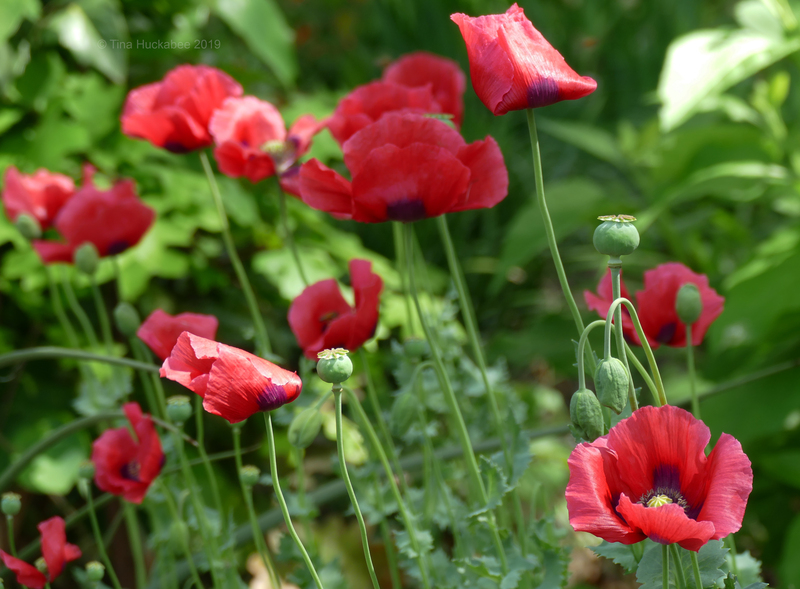 Love all the red- but oh those poppies! Wow! My love for poppies filled fields ,such easy growing cheerful flowers,Beautiful capture of honeysuckle flower with bee on it. Poppies are easy and cheery. 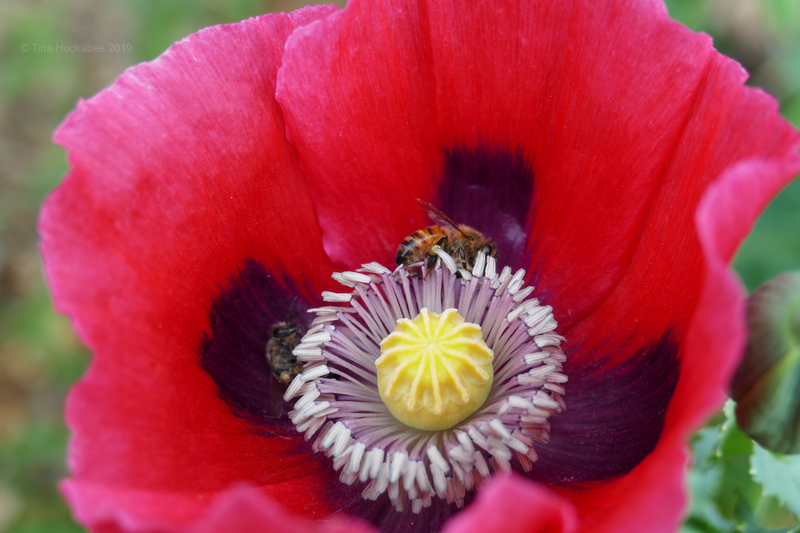 That bee was so well placed–I love it when widlife cooperates! 🙂 You have a great week too.